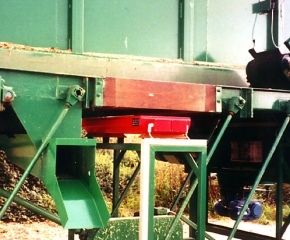 Metal detectors for the non-food (recycling) industry use the same detection technology as those for the food industry. However, the construction is robuster and not all parts are made of stainless steel. 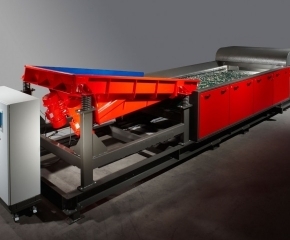 Metal detectors are often used to protect cutting mills/grinding mills/crushers/shredders. 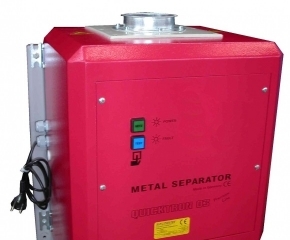 They are also used for inspection at the end of a process, or for removal of the last remaining metal particles in waste wood before its use, in the chipboard industry. In addition, they are also used extensively in the processing of plastic. Detect ALL metals from 0.5 to 1 mm, even non-magnetic metals such as aluminium, copper, brass, etc. Upon detection a signal is generated, which can be used for purposes such as controlling a valve or stopping a conveyor belt. Suitable for belt widths up to 2000 mm or free-fall transport. Most can be delivered in versions compliant with the ATEX directives for dust explosion hazard zone 20. Operation: a metal detector is a conductive coil that produces an electromagnetic field. When a conductive metal object enters this electromagnetic field, it disrupts the field. This disruption is detected and can be used to initiate an action, such as stopping a belt or activating a separation flap to eject the metal. 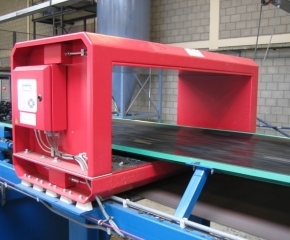 Metal detectors can be built around conveyor belt systems or built into pipeline systems.